As residual snow melted from the St. Paul’s parking lot this winter, I noticed that the striping that defines the parking spaces was growing fainter and fainter. Clearly, the lines will have to be repainted soon. When we do that, I hope that we will adopt an improved striping pattern. We may not be able to create additional parking spaces, but we can free up a little space for cars to maneuver. Most drivers, I think, park their vehicles as close to the stripe ahead of them as possible without going over the line. 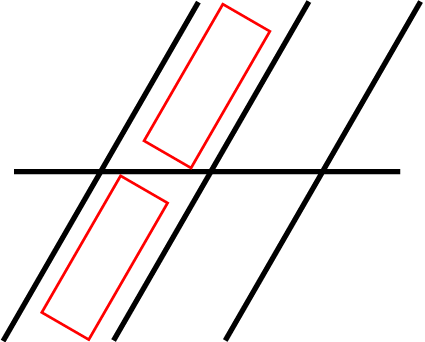 When two vehicles facing one another do this, a gap is left between the front bumpers. 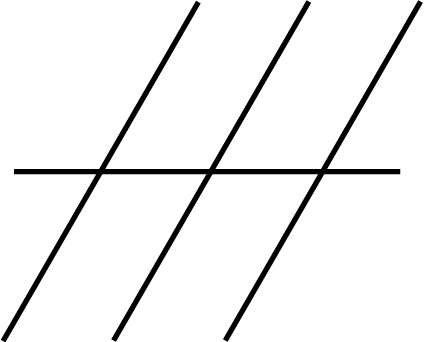 The alternative striping pattern, on the other hand encourages vehicles to park bumper-to-bumper (or very close to it). The result is that the lanes in back of each of the vehicles are a bit wider. How much wider? 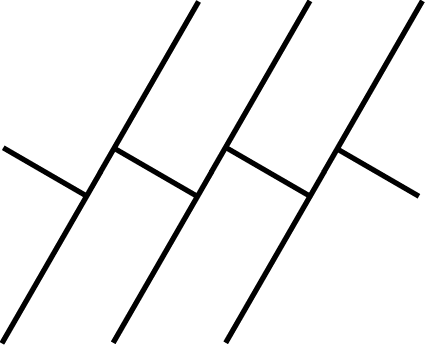 A little geometry and trigonometry will reveal that the answer depends on the angle at which the stripes defining parking places are defined and the average width of a vehicle. Using the 60 degrees and 6 feet, which I think are in the right ball park, the revised striping scheme adds 1-1/2 feet to each of the driving lanes. Why wouldn’t we want to gain that foot and a half? The Lead, a blog sponsored by the Episcopal Diocese of Washington, posted a brief item today titled “Does trite music block us from God?” The question was inspired by an essay from a priest in Perth, Australia, appearing at Times Online. The Lead’s post has elicited an unusually large number of unusually long comments. This outpouring of sentiment is consistent with my observation that church discussions of liturgical music tend to be rather more heated than similar discussions about church doctrine. Read “Does trite music block us from God?” and “Trite music blocks our ears to the divine in the liturgy,” the essay that inspired it. Also read the comments on The Lead. At St. Paul’s we seem to be constantly expanding the range of music we offer. Is that a good thing, do you think? We are always asking how we can bring more people into our congregation. Frankly, I haven’t a clue as to how to do that, but I do know that potential members tend to react strongly, one way or another, to the music used in church. The 10:30 service today lacked a sermon, or, more properly, had a sermon delivered in the form of a Benjamin Britten opera, albeit a quite short one. The work presented was Canticle II: Abraham and Isaac, Op. 51, for piano (Doug Starr), tenor (Rich Williams), and alto (Brian Brazon). The piece tells the story of God’s commanding Abraham to sacrifice his son Isaac. The opera did not fit particularly well with the readings for Easter 4, but it did provide both entertainment—it was beautifully performed—and food for thought. (I have always found the story problematic and not suggestive of a loving God.) The Britten piece has a libretto adapted from a medieval text. That text has its peculiarities, referring as it does both to Jesus and the Trinity. If you missed today’s performance (and even if you didn’t), you might want to listen to the program “Children of Abraham” from American Public Media. You can hear the program or, by clicking on the LISTEN link, you can hear the Britten work performed. Doug Starr surprised me during communion by improvising on the Navy Hymn. It was not immediately clear to me why he chose to do this, but, after the service, Mike Plaskett pointed out that the flowers today were given in memory of Lillian Annette Burke, daughter of choir members Preston and Annette Shimer, a young naval officer who died as her new ship was being made seaworthy. That realization brought tears to my eyes. Only with great effort have I restrained myself from writing about St. Paul’s’ now ubiquitous tag line, “The most welcoming congregation in the South Hills for all generations.” This slogan seems to show up on every document produced by the church. When Lionel Deimel’s Web Log was my only personal blog, I was reluctant to write a candid post about the catchphrase for fear of causing embarrassment to my parish before an audience primarily of non-parishioners. St. Paul’s’ Epistle is hardly a private blog, but the case for reticence is not so compelling here. Besides being somewhat ambiguous, our new, ubiquitous slogan is neither true, nor likely ever to be true, nor, I suspect, an aspiration of most parishioners. Although we have been told it represents an aspiration, the tag line is stated as an assertion. It is arrogant, superficial, disrespectful of other churches in the area, and, frankly, an embarrassment. I believe strongly that we should scrap it. My opinion has not changed in the ensuing three months, though the distaste I have for the slogan has probably intensified. There is little more I need to say now, and I invite comments, positive or negative, on our use of the tag line. I would like briefly to clarify two points, however. More than once, I have been told that the slogan is a vision toward which we, as a congregation, are working; it represents a goal, not an accomplishment. This is essentially what Lou is saying when he writes of “Our Vision.” (I don’t know why that phrase should be capitalized.) Such an understanding may satisfy parishioners to whom the distinction has been explained, but the visitor to the recent Duruflé concert who encountered the slogan on the cover of the program likely concluded that our congregation has already arrived at its goal. Actually, the visitor probably surmised that we think we have arrived. The most welcoming congregation in the South Hills to all generations. Perhaps in another post I will suggest ways of correcting the more fundamental deficiencies I see here. I am new to being the author of two blogs with different but related audiences, and I have to figure out how to handle essays that may be of interest to both audiences. My post “New Verses for a Bad Hymn” on my other blog is what raised this issue. I don’t know how I’ll handle this problem generally, but, in this case, I’ll offer a brief teaser and invite you to visit Lionel Deimel’s Web Log. “Earth and All Stars,” #412 in our hymnal, is a hymn we seem to sing a lot at St. Paul’s, though for reasons that escape me. I dislike the hymn intensely. “New Verses for a Bad Hymn” explains why. What do you think of this “contemporary” hymn? The Messenger is hardly special in its failure to report on many events it earlier promoted. Let me try to create a different tradition here. If you missed last night’s concert at St. Paul’s devoted to the music of the French organist and composer Maurice Duruflé, you missed a very fine concert indeed. 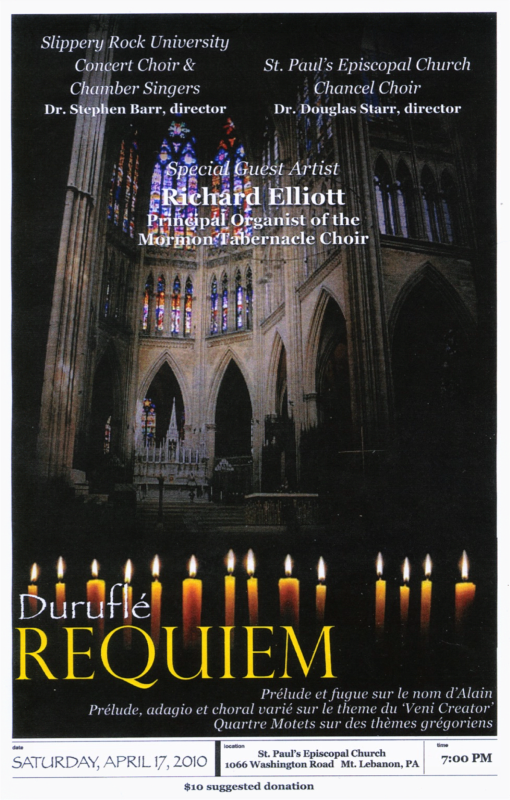 The centerpiece of the program was Duruflé’s Requiem, Op. 9. Slippery Rock University’s Dr. Stephen Barr directed the performance of St. Paul’s Chancel Choir and the combined choirs from Slippery Rock University. Accompaniment was provided by a small orchestra that included some Slippery Rock students and by Principal Organist of the Mormon Tabernacle Choir Dr. Richard Elliott. The pre-intermission part of the concert was rounded out by two pieces played by organist Richard Elliott. These were Prelude et fugue sur le nom d’Alain, Op. 7, and Adagio et choral varié sur le theme du ‘Veni Creator,’ Op. 4. The former is one of my favorite organ pieces; I had not heard the latter before. Both compositions were impressively played by Elliott. It’s too bad that the organ console was not positioned so that the audience could see his hands and feet, since they were obviously getting quite a workout. Elliott was very impressed with St. Paul’s’ organ, by the way. I can hardly comment on the performance of the Requiem as an objective observer, as I was one of the singers. I cannot even compare our effort last night to rehearsals, as we had never done a complete run-through of the mass. I thought we acquitted ourselves well, however, and the audience seemed to agree with that evaluation. Steve Barr did a fine job of preparing the musicians and of conducting the performance itself. I was pleased that rector Lou Hays introduced the program. In the past, clergy at St. Paul’s have not always supported musical performances in such a conspicuous way. I was surprised to learn that one reason the Slippery Rock people were performing at St. Paul’s is that the university does not have a good performance venue, certainly not one with an organ, at any rate. Needless to say, the singers at St. Paul’s were delighted to work with the Slippery Rock students. I hope the people of St. Paul’s will show up in large numbers for the 7 o’clock performance. The turnout for such programs is often disappointing. I don’t know if this is because parishioners are too busy or are just not much interested in such things. St. Paul’s has a surprisingly low profile in the community, but musical programs like the one tomorrow night help raise that profile and, one hopes, makes it more likely that South Hills residents will, at some time, join our church. Update 1: I went by St. Paul’s this afternoon and noticed that we have one of our big signs out on the front lawn, but it is not advertising tomorrow’s concert. Pity. Update 2: I stopped by the church on my way home to set up some microphones for tomorrow night. The lights flickered as I was working, and it took me a moment to realize that the thunderstorm had arrived. As I was leaving, I saw that our “New Morning” banner on the lawn had been shredded by the wind. For many years, I have been spending my Saturday mornings between 8:30 and 9:30 in the St. Paul’s lounge participating in the Saturday Bible Study. This activity, which has been going on for many years, doesn’t get much attention. It is run by laypeople and has never had regular clergy participation. It was once called Men’s Bible Study, but we have long since opened the group to women as well. Our Saturday morning group is small, but lively, and I invite you to join us. We have no official leader, but we take turns bringing breakfast, usually pastries or bagels. We meet almost every week, though we sometimes cancel if too many people will be out of town or if the lounge is needed for another purpose. I should warn you that anyone showing up with a Bible in hand is usually disappointed. Over the years, the group has, from time to time, done something like regular Bible study, but, more often than not, we have read and discussed other Christian literature or books about our Christian heritage. Recently, we have been viewing half-hour lectures on DVDs of college-level courses on the Bible, the early church, or other religious topics. The remaining half hour is spent in fellowship and conversation. That conversation usually focuses on the lecture, but it often moves to discussions about St. Paul’s, the diocese, the wider church, or even current events. Regular attendees have learned a lot about our Christian heritage and had a lot of fun doing it. At the moment, we are working our way through a 36-lecture course on mysticism in Judaism, Christianity, and Islam. This is an eye-opening, though somewhat weird, experience. If you’re shy, Saturday Bible Study may not be for you. The conversation can be lively, and we encourage everyone to jump in. Of course, some people just like to listen. In any case, consider joining us some Saturday. You may find that you want to keep coming back. Welcome to St. Paul’s’ Epistle! This blog has a funny name. It is not, of course, either written by or about St. Paul. Instead, it is about St. Paul’s Episcopal Church in Mt. Lebanon, Pennsylvania. I hope that explains the two apostrophes. Using the word “epistle” to refer to the blog is, I suspect, a transparent play on words. I should be quick to clarify that that this blog is about St. Paul’s, but by no means is it by St. Paul’s. It is an unofficial blog with no formal connection to the church’s leadership. I am simply a parishioner who has a tough time keeping his opinions to himself. I am not a cradle Episcopalian. I was reared Presbyterian and was confirmed in the Episcopal Church in 1982. I came to St. Paul’s in 1987. I have never been on the Vestry, though I was on the now-dormant Parish Council for a time. I have been a member of various committees, and, for many years, was Audio-Visual Coördinator, a now-dormant volunteer position. By virtue of being Audio-Visual Coördinator, I served on the Worship Commission and was its secretary. I have sung in the St. Paul’s choir almost since the moment I first walked in the door. I am a computer consultant and writer, and my computer and writing skills have, from time to time, been put to use in the parish. I should also disclose that I am a liberal (whatever that means), as well as something of an Episcopal Church activist. For most purposes, I expect that these facts will be largely irrelevant here. Except in the very smallest parishes—St. Paul’s is definitely not one of those—communications are always problematic. Parishes tend to consist of weakly interacting small groups of more strongly interacting individuals. Official communications from the church may or may not tell parishioners what they want or need to know, and parishioners may or may not take advantage of the information that is made available to them. There is invariably too little feedback to leaders from ordinary parishioners, absent a major crisis, and those responsible for parish communications work hard to avoid the perception that there might even be problems, let alone crises. I have often thought that many parishes could benefit from an independent newsletter, but, in times past, that has not seemed a practical idea. Some time ago, I created a Web-based computer bulletin board to facilitate conversation among parishioners of St. Paul’s. This was spectacularly unsuccessful. People did not participate, and I was told by a Vestry member to take down the bulletin board and surrender the domain to the church. I did neither, but it really didn’t matter. The experiment was a failure. St. Paul’s’ Epistle represents a second attempt to facilitate parishioner conversations outside the normal official and unofficial channels. I will do most of the writing, and parishioners can comment on what I say. I will continue to write, even in the absence of comments. I am receptive to the idea of guest essays and even to the idea of regularly sharing the blogging duties. Volunteers, anyone? You can surely expect posts here decrying matters with which I am unhappy. I hope to report on good things that are happening at the church that not everyone will otherwise know about. I will also report on issues of, shall I say, limited interest. I hope that parishioners will find this blog interesting but not intrinsically subversive. As some readers may know, I have a Web site, Lionel Deimel’s Farrago, and a blog, Lionel Deimel’s Web Log. Is St. Paul’s’ Epistle really necessary? Anyway, I love St. Paul’s and wish only the best for it. Let’s explore together how this blog can make a positive contribution to the parish. When you discover this blog, tell you fellow parishioners about it. One final note—I’m working at making the blog look attractive and helpful. Bear with me if the blog looks different each time you visit. It will settle down eventually.